Current and emerging therapies to prevent HLA antibody production. (A) Naive B cells rely on signals from CD4+ T cells for full activation, Ig class switching, and Ig production. Blockade of costimulation using the CTLA4 fusion protein belatacept inhibits this important signal and hampers B cell activation. Naive as well as antigen-experienced B cells may be depleted from the circulation with antibodies against CD20, such as rituximab. Once HLA antibody–producing B cells have differentiated into plasma cells, they are more difficult to target. Because these antibody “factories” are metabolically active and reliant on the function of the proteasome, inhibitors such as bortezomib and carfilzomib, which block the 20S proteasome, may trigger apoptosis of these cells. Bortezomib is a reversible inhibitor, while carfilzomib is irreversible. Antibodies may also be physically removed from the circulation with plasmapheresis, and their effector functions inhibited by intravenous immunoglobulin (IVIg). 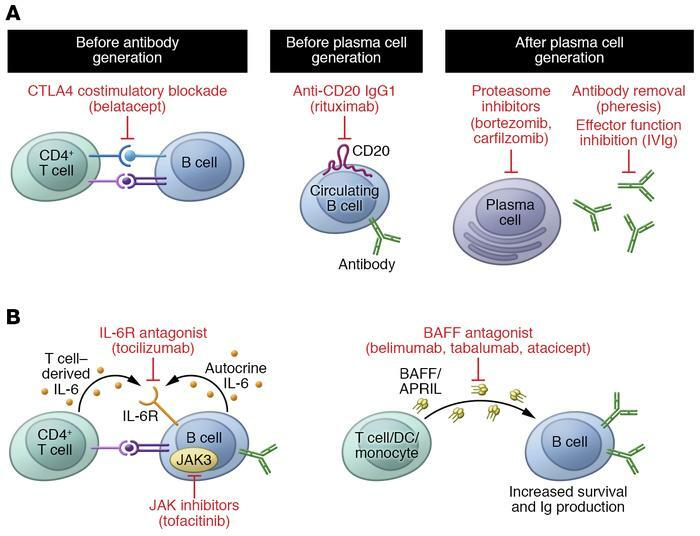 (B) Emerging therapies to reduce alloantibody production include antagonism of the IL-6 receptor (tocilizumab), BAFF (belimumab, tabalumab, atacicept), and inhibition of intracellular JAK (tofacitinib), which are needed for B cell activation and Ig production. BAFF/APRIL, B cell–activating factor/a proliferation-inducing ligand.